I did a terrible job of officially announcing the kick-off of the guild quilt, partly because there was so much going on at the December meeting, and partly because there was not enough fabric to go around. This challenge will be due at our February meeting, so if you did not get a bundle of fabric to play with, leave a comment and I’ll use that count to be sure that everyone gets theirs at the January meeting on the 16th. Here is our mission: We are going to make a quilt to serve as our own banner of identity. The fabric is solids pulled from the colors of our logo– Kona Chartreuse, Lagoon, Bright Pink and Orange. Each bundle has three of the four colors, roughly a fat eighth of each. If you’d like, you can also use Kona White (check against a swatch– there are a lot of different shades of white) in your block. The challenge is to make a block that represents what modern quilting is to you. 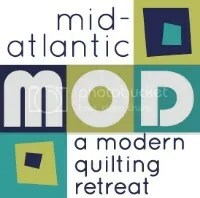 This is how The Modern Quilt Guild describes modern quilting. But it’s open to interpretation. Our goal is to have a conversation about what we like about modern quilting and make a quilt that shows how we as a guild represent as modern quilters. This could mean making a traditional block with solids, using lots of contrast and negative space or improvisation. But we are quilters of modern time, so whatever we make will be modern. Remember to be yourself! I don’t use the word challenge lightly. There will be some kind of winner chosen as a favorite block– perhaps by a popular vote– with a special prize. So let me know if you’d like to participate and don’t already have fabric. And if you have yours, get designing! EDITED TO ADD: Blocks can be any length or width, but it must be a rectangle or square with at least two opposing sides measuring 12.5″. I would love to participate. Can my daughter Jessica pick one up up for me at the meeting? I want a bundle too! I forgot to tell you that in person! Save me a bundle. Pretty please : ) Can’t wait. I would love a bundle and look forward to participating. Great! We’re happy to have you. I would like a bundle too. I hope that the Kona white will be available for purchase. I’m pretty sure the block had to be 12.5 inches on two sides. Thanks so much for laying out the challenge in writing as I wasn’t paying attention when you spoke about it. Is there any restrictions on the size or shape of the finished block? Thanks for asking, Diane! It has to be 12.5″ on two sides. I updated the post. Thanks for clarifying the shape and size. This will help me decide what to do for the challenge. See you Thursday! No problem. I can’t believe it’s next week already! I would like a fabric bundle! Also, what size is the block? Woohoo! Block is 12.5″ on two sides. I updated the post. Thanks for asking. I will also have your swap gift! 12.5 unfinished? I picked up my stuff today…thanks again! But my Secret Santa did not identify themselves. I would like to thanks them! Judy Veltidi here. I was not at the December meeting but would like to receive some of this fabric to make a block….Please have some for me at the January meeting….assume the Kona white will be available for purchase then, too. Also, Mel, remember my MQG pin you “promised me”. Hi Judy, I sent you an email response. Either comments or emails make it to me and I will do my best to answer in a timely way. Please save a bundle for me. Looking forward to seeing the creativity of the group. Thanks. I’m really looking forward to seeing what people make too!